With a population of 1.4 million, Kent is one of the largest counties in England. The library service covers 99 library buildings, 5 mobile libraries plus a range of outreach and online services. We are also fully integrated with the Kent Archives and Registration service meaning we offer seamless access to customers to a wide range of services. On 1 April 2016, Kent Libraries, Registration and Archives (LRA) became an internally commissioned service as part of Kent County Council (KCC). The aim of this model is to ensure that LRA delivers the best possible outcomes to the residents of Kent. Members, led by the Cabinet member, were fully involved in developing the specification. Key Performance Indicators: These are mainly outputs; numbers that indicate level of use, for example, the number of people who visit our buildings. This is the traditional way that LRA has been measured and is still an important benchmark of performance, but we have thought carefully about what are the relevant KPIs for a modern library service. Outcomes: These criteria are a really important development and something that LRA endorses as a way forward. Outcomes allow a focus on the quality of the experience/services for the customer which is at the heart of what we do. This enables LRA to better demonstrate the positive difference these services can make to the people of Kent. Measuring contribution to outcomes should also allow the services to better demonstrate the impact and difference we make to the customer. LRA is looking at how it can devise a toolkit for outcome evaluation as this is an area that needs more development. This could have wider benefits, not just for KCC but also for other library services, and we note this is a theme of the Libraries Deliver: Ambition document. 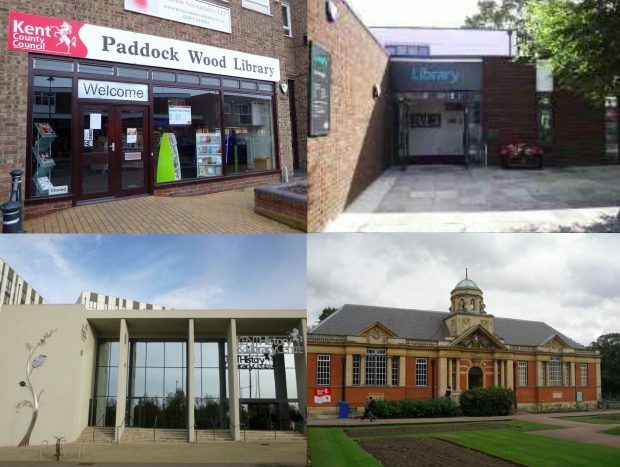 We also continue to look at opportunities to modernise our buildings and these were some comments received about the recent refurbishment of Dartford library: ‘The library looks lovely with lots of new books available’, ‘beautiful - fresh but still retained the essence of the building’. Our service continues to deliver a home library service through a team of volunteers that deliver books to people’s homes, and we now also offer a ‘Touch a New World’ service where housebound customers can also loan an iPad and get the support of a volunteer to use it. ‘The world can come into my life. Now that I am 95, I can’t do what I did. I used to love travelling and, with the iPad, I can explore the world from my armchair’. Customer commenting on Kent’s ‘Touch a New World’ service. Kent welcomes the opportunity to join the discussion on outcome evaluation so we all get better at recognising and evaluating the difference our services can make. LRA is developing a more commercial outlook. This includes looking at a range of opportunities to generate income and looking at how we can upskill staff to meet this challenge. Through the service specification, KCC articulated what was required to be delivered and, in response, LRA has produced a service plan that explains clearly how it will deliver against this. This is being monitored quarterly and will be subject to a review against how we have done at the end of the financial year. Keep up to date with activities in Kent libraries by following them on twitter. Can someone please explain why a 10 year old library member at new ash green library,who completed summer holiday reading challenge, was told he could not use the library as he was not with an adult? This is outrageous and is contrary to stated council policy of children getting the best start . It would seem to be easier to get children hooked on drugs than hooked on reading! Thank you for bringing this to the attention of myself and my colleagues in the Kent Libraries Management Team. Please accept our sincere apologies for any distress this experience caused. We want as many children as possible to enjoy their local library so your comment is disappointing and something we take very seriously. Kent Libraries' policy is that no under 8-year-olds should be unescorted in our libraries so this was clearly a mistake or misunderstanding. We have tried to contact you directly to get more details, but in the meantime we have clarified and reminded staff of the age policy for children. We hope this has not deterred you or the child in question from using the library. Please do get in touch with us so we can look into this further.